Air is mainly made up of two gases – oxygen at 21 per cent and nitrogen at 78 per cent. Our bodies metabolise some of the oxygen in the air we breathe, but the nitrogen is inert. When we put ourselves under pressure, as we do when we go underwater, our bodies absorb some of the inert nitrogen. As we go deeper and stay longer, we absorb more. The time that we spend underwater is limited by the amount of that nitrogen we absorb. That is why divers use tables or a diving computer to calculate how long they can stay safely underwater. Nitrox is any gas mixture composed of nitrogen and oxygen, including air. Air is known as Nitrox21 due to its 21 per cent oxygen content. Most nitrox mixes used by divers are more than 21 per cent oxygen and less than 78 per cent nitrogen in order to reduce the problem of nitrogen absorption. Nitrox32 is 32 per cent oxygen, while Nitrox36 is 36 per cent oxygen. Breathing a nitrox mix containing more than 21 per cent oxygen reduces the chance of a diver getting decompression illness due to staying down too long or coming up too quickly – providing no-stop times and ascent rates for air are adhered to. You can simply adjust your decompression requirement by adjusting your computer to match the nitrox mix that you are using and, in that way, get more time underwater. There are also nitrox tables to suit different mixes. However, oxygen has its problems, too. Pure oxygen becomes poisonous at quite low pressures. It is currently thought unsafe to breathe pure oxygen at a greater pressure than 1.6 bars underwater, and that occurs at only 6 m (20 feet) deep. Therefore, each specific nitrox mix has its own maximum operating depth, and nitrox training agencies all limit the use of oxygen to 1.4 bars of partial pressure within a mix with nitrogen. The oxygen in air (Nitrox21) can become hazardous at 54 m (177 feet) deep. This does not affect leisure divers limited to an absolute maximum depth of 40 m (130 feet). A standard mix of Nitrox32 should not be breathed deeper than 32 m (105 feet). Some training agencies limit new divers to 30 m (100 feet). Most popular sites for diving in the world now adhere to a 30 m (100-foot) limit for leisure diving. PADI Open Water Divers with Level One training are still limited to a maximum depth of 18 m (60 feet) during training, but suitably qualified divers can use Nitrox32 to its full maximum operating depth (MOD). When using nitrox, a diver does not need any additional diving equipment, only the knowledge of how to analyse the contents of a tank before diving, using the analyser that has been supplied by the dive centre. In the future, all new divers will likely start breathing nitrox, and air for diving will only be for specialised use. More advanced divers use nitrox to speed up their decompression stop times. They take additional tanks of rich nitrox with them on a dive and swap to use these to breathe from once they have ascended shallow enough for it to be safe to do so. 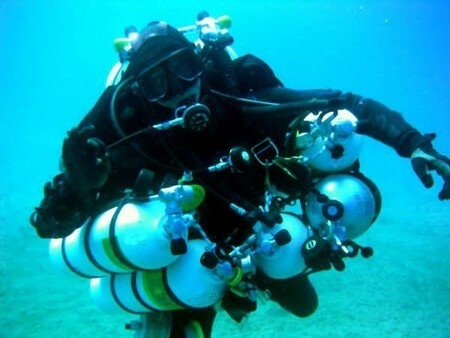 The more advanced diving computers allow divers to set different levels of nitrox and to switch to the one that matches the nitrox mix the diver is breathing at any point in the dive. In that way, the computer tracks both the decompression stop time requirements and the amount of oxygen exposure accurately.